Obesity is a common problem that is experienced by the general public. The world health organization acknowledges that obesity is a worldwide problem which also affects many developing countries. Since obesity can be the beginning of medical illnesses like type 2 diabetes mellitus, hypertension and cardiovascular diseases most people are concerned about weight gain. The growing weight gain problem in humans has affected children, adults, and older people. There are many recognized causes of weight gain. Depending on the cause, obesity is categorized as simple and pathological obesity. Simple obesity is mainly due to increased caloric intake and sedentary lifestyle among the general population. In pathological obesity, it comes as an associated feature of another medical condition. Most commonly these conditions are endocrine disorders like hypothyroidism, Cushing’s syndrome, hypothalamic disorders, etc. It is important to be aware of when to see an endocrinologist for weight gain. 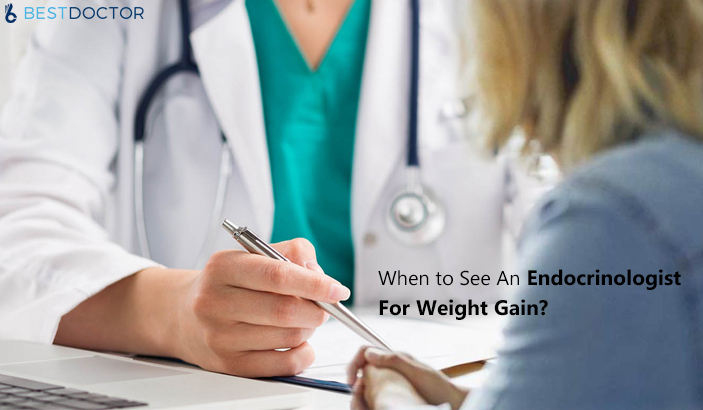 When To See An Endocrinologist For Weight Gain? Cushing’s syndrome is a disease which occurs due to prolonged exposure of glucocorticoid blood levels. It may be deriving from pituitary tumor (Cushing’s disease), adrenal gland tumor, ectopic adrenocorticotropic hormone (ACTH) secretion, and most commonly exogenous glucocorticoids. If you are having central obesity with fat accumulation in the face, neck, dorsocervical area which is also known as the buffalo hump, abdomen with sparing or wasting of the extremities, your weight gain might be a reason to see an endocrinologist. In addition to the characteristic weight gain, easy bruising, thinning of the skin, impaired glucose tolerance and pathological fractures also can be presenting symptoms. Since Cushing’s syndrome can be resulting in complications like type 2 DM and osteoporosis, it is important to seek medical advice and remove the factor which is causing excess glucocorticoid levels in the body. Exogenous glucocorticoid intake is a very common scenario encountered by the clinicians. Patients may be taking steroids in forms of oral pills, topical agents or inhalers. Patients with nephrotic syndrome, systemic lupus erythematosus, and bronchial asthma are at risk of developing Cushing’s syndrome because they are on long term steroids. Hypothyroidism is another condition when you might want to see an endocrinologist for weight gain. When the body’s thyroid hormone levels are below normal levels, the body’s metabolic rate, energy expenditure and utilization of substrates become lowered and results in some amount of weight gain. In addition, deficient thyroid hormone levels result in accumulation of mucopolysaccharides, with increased water retention in the body causing weight gain. Symptoms like cold intolerance, constipation, dry coarse skin, increased sleepiness, heavy menstrual bleeding are other supportive symptoms of hypothyroidism which will alarm you to see an endocrinologist for weight gain. If you are experiencing the above-mentioned symptoms along with weight gain, it would be better if you can at least arrange an online appointment with an endocrinologist because it can be corrected with the aid of medicine. In the discussion of when to see an endocrinologist for weight gain, obesity due to hypothalamic causes should never be missed. Patients with hypothalamic tumors, trauma or inflammation might present with headache, vomiting, visual disturbances, loss of libido, etc. Hypothalamic tumors should be surgically removed and further necessary treatment plans should be carried out. In that case, it is important that you identify those symptoms as a reason to see an endocrinologist in the case of rapid weight gain. Polycystic ovarian syndrome (PCOS) is one of the main reasons for females to seek medical advice in case of weight gain and is the most common female reproductive disease affecting 5-10% of premenopausal women. The key clinical symptoms of PCOS are menstrual irregularities, hirsutism, acne, and male pattern hair loss. Polycystic ovaries on ultrasound scan, subfertility, insulin resistance, and obesity are other associated classical manifestations of the syndrome. Women with the above-mentioned symptoms are advised to seek medical help with regards to the correction of their hormonal imbalances. Growth hormone deficiency and insulinoma and pseudohypoparathyroidism are some other reasons to see an endocrinologist. Even in simple obesity, it is always important to see an endocrinologist to get your weight under control, in liaison with a nutritionist. Because it is necessary to identify the co-existence of complications associated with obesity and control them to prevent the possible occurrence of cardiovascular events. When the patient pays the first visit to the endocrinologist, the doctor will order a few tests depending on other presenting symptoms. To detect Cushing’s syndrome overnight dexamethasone suppression test will be performed. In suspicion of hypothyroidism, TSH levels are tested followed by T4 and T3 levels if necessary. In addition to diagnostic tests, the endocrinologist will run some tests to detect complications associated with obesity. Fasting blood sugar will be done to detect diabetes mellitus associated with obesity. Lipid profile will also be ordered to test for hypercholesterolemia. Ultrasound scan of the abdomen will be performed to identify fatty liver associated with hypercholesterolemia and diabetes. So all above-mentioned conditions can be considered as occasions of when to see an endocrinologist for weight gain and necessary treatments should be obtained promptly to prevent the development of obesity-associated complications. Previous PostWhat Questions Do Gynecologists Ask on Your First Visit? Next PostWhen To See A Doctor For Cold? How To Book Doctor’s Appointment Online?